Discover how bringing in natural light can give your life a healthy glow. Biophilic (meaning “nature-loving”) design is considered by many to be the missing piece in green architecture today. Derived in part from the life’s work of prominent American biologist E.O. Wilson, this emerging design discipline strives to move modern building practice into the same sustainable direction as the green building movement. But it goes further, seeking not only to minimize impact on planetary resources, but to actively improve human health, well-being and productivity. Today, many architects and designers are mining their intuitions for hints at what our collective human nature has been hungering for in the built environment. 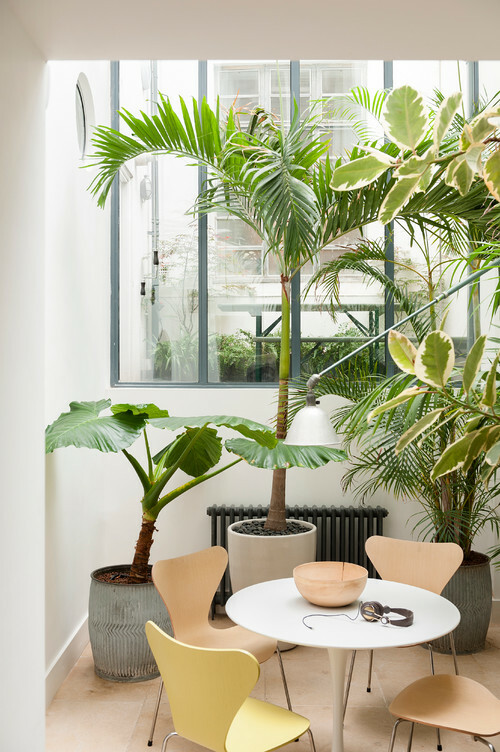 This Healthy Home series celebrates time-tested, rather than high-tech, strategies for turning your home into a biophilic paradise, starting with the biophilic benefits of sunrooms and conservatories. Capturing solar energy has everything to do with how you design and orient your windows. This will depend largely upon your site, but generally a sunroom facing within 30 degrees of due south will make the most of the sun’s rays. Incorporating an overhang will provide respite from when the sun is at its harshest and invite the sun in when it hangs low in the winter. As useful as some sunrooms can be in regulating the home’s internal temperature, windows are poor insulators and often cause rather than cure the need to artificially modify the indoor temperature. For this reason, in many locales, the sunroom is used like a screened-in porch: as extra living space for a few months of the year, but otherwise sequestered behind an exterior wall and accessible by a door. 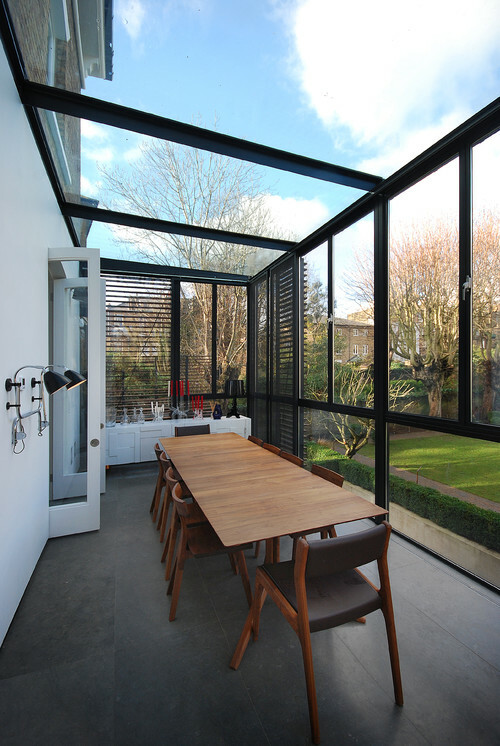 Before building a sunroom or conservatory, take a frank inventory of your requirements for the space and discuss with your architect how you might design the space to make the sun your ally, not your foe. Working with, not against, nature is the hallmark of biophilic design. 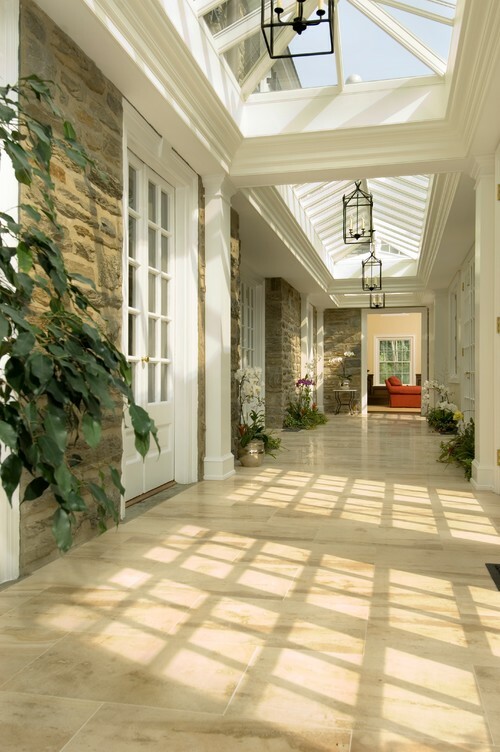 Photo by E. B. Mahoney Builders, Inc.
A hallway that was built as part of an addition masquerades as a sunroom here with skylights to scatter sunlight and warm the interior. The homeowners decided to preserve their Georgian home’s gorgeous stonework, so they worked the addition around it. The material preservation plus the inclusion of plants and natural light uphold the basic tenets of biophilic design. Specifically, these features all coalesce to maximize the home’s connection to a world beyond itself in both time (by honoring the home’s original stone) and place, as shadows put the occupant in touch with nature’s clock. 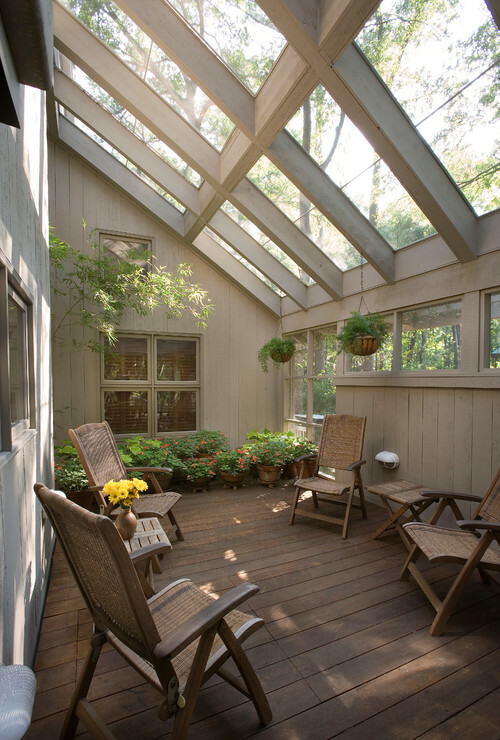 A conservatory is typically defined by an all-glass enclosure. Although “sunroom” is a broader term that encompasses heavily windowed spaces with skylights or not, a conservatory is all about the crown. Being so completely open to sunlight makes conservatories a prime spot for growing plants. Where else in the home could you top your dining area with a halo of natural vines? Some might not formally label this diminutive nook a “sunroom,” but I do. This little breakfast haven has all the trappings of a great sunroom, including a wall of windows, thriving plant life and what I suspect is a skylight tucked into the ceiling. Normally, when you cap a room with a glass ceiling, you’re hoping to capture every last ray to either passively heat or light up your room. 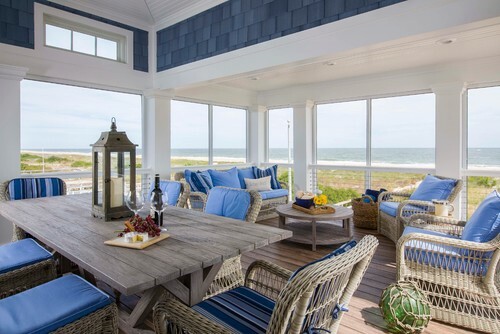 If, however, you badly wanted a sunroom, but because of site restrictions or some equally insurmountable challenge you had to position it so that it’s prone to overheating, you may find yourself in need of a little shade. This room maintains its connection to the natural world through smooth branches that form a canopy and room divider, and light gets filtered the way it naturally would through tree branches for a more organic lighting scheme. Fabric is the customary alternative to the branches shown in the previous photo, of course. Gossamer gauze shades like these will need to be fastened by a professional so that they don’t swing down with gravity, but if a softly filtered light is what you’re after, you’ve found the perfect solution. 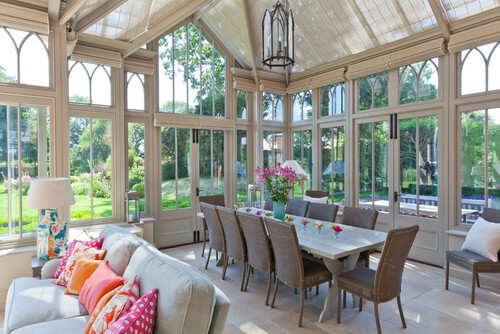 The major purpose of a sunroom or conservatory is to bridge the indoor and outdoor realms. If you want to give one of these technically indoor rooms an outdoor feel, you can accomplish this by selecting outdoor finishes and materials. 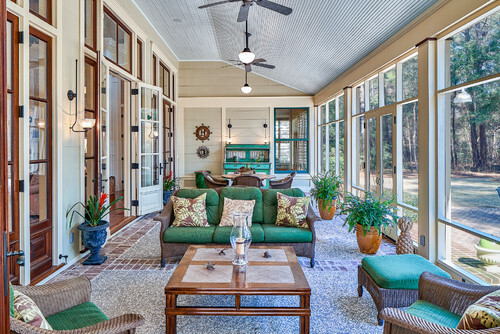 In this South Carolina sunroom, we see exterior siding used on the back wall and brick accents in the flooring. Since outdoor materials like these shingles are created to withstand the elements (Delaware ocean breezes, in this case), you can rest assured that they’ll be more than adequate to meet your indoor needs and stand up to the salt air that blows in through the ample windows. In combination with the decking on the floor and the fact that this room is removed from the rest of the home by a sliding glass door (not pictured), those shingles drive home the outdoorsy ambiance of the space. 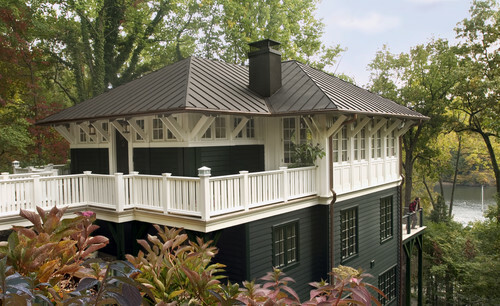 The walls may be regular indoor wood paneling or exterior cladding, but the floors and the abundant thriving plants unequivocally scream, “We’re outside!” This is an unusual sunroom in that the windows in the walls are not all that extensive; they’re rather like clerestories hovering at the top of the room. It’s really the ceiling of windows that give this sunroom its name. 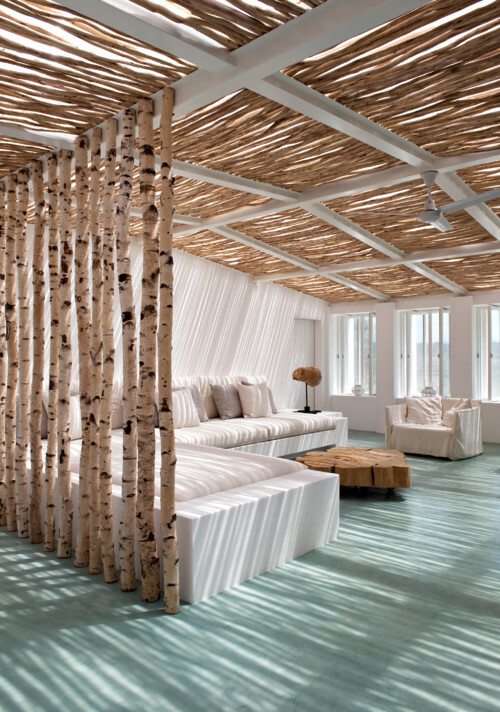 This article is from Jess McBride of Houzz.